Submitted photo Retired Tech. Sgt. Felita LaRock sinings the National Anthem at the start of the Air Force Security Assistance and Cooperation Directorate’s 22 Annual Black History Month Luncheon. WRIGHT-PATTERSON AIR FORCE BASE — In observance of Black History Month, the Wright-Patterson 88th Air Base Wing African-American/Black History Month Special Observance Committee and the Air Force Security Assistance and Cooperation Directorate hosted various activities throughout the month. The African-American/Black History Month Special Observance Committee luncheon, themed African-Americans in time of war, was held in the Wright-Patt Club Grande Ballroom Feb. 21. Guest speaker Marsha Bonhart, director of media and public relations for Dayton Public School, reflected on countless African Americans who fought for America and their freedom during wartime since the late 1700’s up to the present day. The luncheon also showcased the Wright-Patterson Community Choir and the Montgomery County Pan-Hellenic Council, who demonstrated and gave the history of stepping. In recognition of educational excellence, ‘Blacks in Government’ presented Alana Wall with a $500 scholarship. Another event hosted by the Black History Month Committee was a movie night, featuring the film, “The Tuskegee Airmen” Feb. 15 in the United Service Organization auditorium. Rounding out the month, the committee worked in conjunction with Civilian Health Promotion Services to conduct health screenings on Feb. 14 and 28. These screenings provided detailed information and screenings for warning signs of heart attack and stroke. The Air Force Security Assistance and Cooperation Directorate hosted their 22 Annual Black History Month luncheon at the Wright Patt Club and Banquet Center, Feb. 22. Hosted by AFSAC director, Brig. Gen. Gregory Gutterman, the luncheon also themed, African Americans in time of war, featured musical selections by retired Tech. Sgt. Felita LaRock, a former soloist with the Air Force Band of Flight. Col. Robert (Bruce) Monroe, Deputy Director, Department of Defense Special Access Programs Central Office, Pentagon, Washington, D.C., provided the keynote address. Gutterman opened the luncheon by thanking the committee members who had put the event together, and then said that the stories we hear at events like this demonstrate how fogged up our lenses can become. He then explained that these events also help to clear off some of that fog. Monroe began his address by thanking the AFSAC leadership for attending the event saying that their attendance means a lot to not only the people who spent a lot of time putting the event together, but also to their employees by demonstrating that they care about how their folks celebrate people and culture. He then went on to talk about some of the many inspirational speeches he had heard from senior DoD leaders while in D.C.
Monroe told the audience about his father who was born the son of a sharecropper in the Jim Crow South in a very segregated part of North Carolina. He explained how his dad had enlisted in the Air Force and went to linguist school and the struggles he faced there proving that he could handle the material after receiving push back from his instructors who had tried to steer him into a less challenging curriculum. After completing the training, his dad served as a Russian linguist where he worked for a Mexican American lieutenant at an overseas assignment who had been silenced while attending the Naval Academy, meaning no one could talk to him, which led him to take his commission in the Air Force. The lieutenant encouraged Monroe’s father to go to college, which he eventually did and went on to become the first black instructor at the Air Force Academy, and was the first black man in North America to earn a Ph.D. in computer science. Monroe explained that the irony of him being the black history month speaker was that by growing up in Colorado Springs, Colorado he was the only black kid in any of his classes for the first eight years of his school career. It wasn’t until junior high that there were any other black kids in his class. But his dad instilled in him a diverse view of Black America even though he didn’t really know many black people outside of his immediate family. Monroe said that his dad wanted to make sure that he had a fully perspective. “Though my dad didn’t think that I would be mistreated by my immediate friends, or be treated any differently as any of the other kids in the area, his fear was that when I left Colorado Springs and got into college, and later into the workforce, people would look at me and not expect as much. Not because they consciously wanted to be racist or oppressive, but because they didn’t know of their unconscious bias, which is far more prevalent than conscious prejudice,” he said. Monroe went on explain how far we’ve come as a nation and related a story of when he was asked about what he was most proud of during a presentation. He answered the question by first explaining that he had two lieutenant colonels working for him in his organization who came from non-English speaking families, one originally from Peru and the other from Puerto Rico. Both of them had earned advanced degrees in aeronautical engineering, and both had since been selected for O-6. “The thing that makes me swell with pride more than anything else is that as a black 0-6 running a wing at a group command, and working with two O-5s who were raised with English as a second language, to me that embodies everything that we want in diversity in a work force in the United States Air Force,” he said. https://www.fairborndailyherald.com/wp-content/uploads/sites/50/2018/03/web1_felitalarock.jpgSubmitted photo Retired Tech. Sgt. 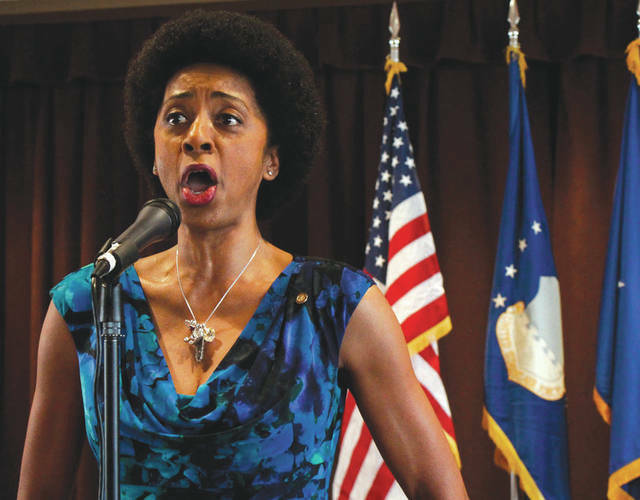 Felita LaRock sinings the National Anthem at the start of the Air Force Security Assistance and Cooperation Directorate’s 22 Annual Black History Month Luncheon.